Rehema Nabukenya is a hardworking mother who raises her four children in the Mpigi District of Uganda. 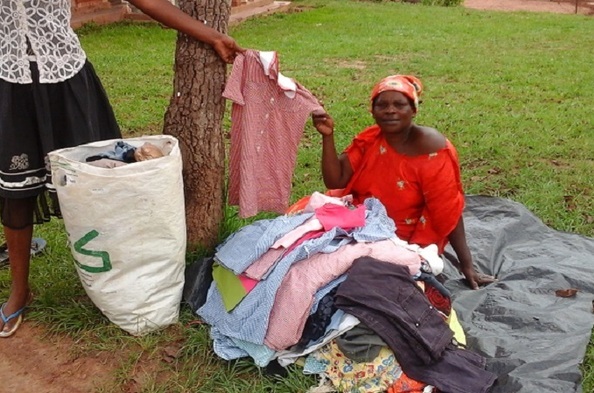 For many years, Rehema has owned and operated a resale business where she sells gently used clothes to those in and around her community. Rehema’s days are long—each morning, she wakes up early to either set up her shop or travel to surrounding towns to sell at their local markets. Despite her best efforts, there was a time when Rehema worried she would not be able to afford to meet the daily needs of her children. Everything began to change for Rehema when a friend encouraged her to join Opportunity International. Rehema received financial training and a loan to invest in her business. With more clothing to sell and a greater selection of styles, she was able to attract new customers and increase her sales. Down the road, Rehema dreams of saving up enough to open a restaurant and hotel in her community. Thanks to the loan she received, Rehema will be able to pursue her own passions while ensuring her children receive a quality education.